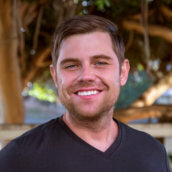 Hailing from the hills of Ventura, CA, Sean is a full-stack developer with more than 7 years experience coding mobile applications in Swift, Objective C, Unity, FB Studio, Snap Lens Studio and Node JS. On weekends, Sean spends his free time building AR, ML and IoT projects, studying mobile application design patterns and growth hacking strategies. When he’s not writing code, Sean loves working out and playing with his fat cat, Romeo.